Get On, Sit Down, Buck Up, Hold On! Cheer and laugh as riders desperately try to keep their balance to see just how conquer-a-bull our mechanical bull really is. 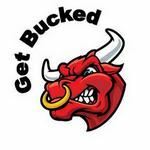 Our OSH registered bucking bull is the ultimate in wild west, rodeo style party attractions. It allows for great audience participation and rider satisfaction! The bull will BUCK violently up and down, left and right, with 360 degrees of rotation. He starts slow and easy for all you knock-kneed greenhorns, working up to flat out like a stampeding herd of long horns for all you trail blazing cowboys n' cowgirls. The bull is suitable for almost everyone as long as the person can get on without any help. We can even set it to manual control for the kiddies n' grandmammy's. . Challenge the clock and your mates! Our large time display stops dem rustlers telling tall tales. We even have some extra challenges, if you can stay on long enough! We are the ONLY company that provides a bullfighter INSIDE the ring to assist with your mounting/dismounting giving you a fun ride. You will be safely cushioned by our inflatable rodeo pit after your artistic dismount. We aim for everyone to have a fair crack of the whip. 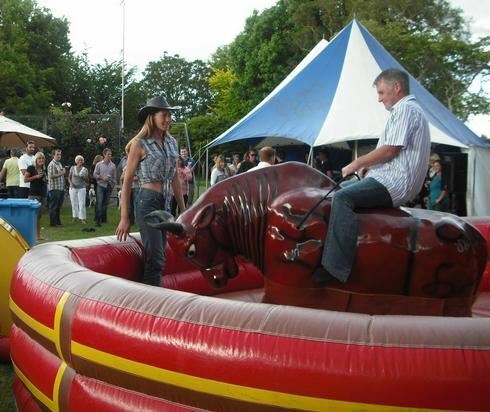 Riding a bucking bronco is a challenge; too slowly defeats the purpose, while too quickly disheartens riders. We're in the amusement business and making people look like fools is not very amusing, and not what we are about. No animals were harmed in the creation of this promotion. We endeavour to make this the best event of your life, help us to help you. However, if you book us without meeting the criteria below, we reserve the right to leave and the full fee will still apply. The driveway must be clear of low branched trees, archways and tight corners etc as our bull travels in a full horse trailer approximately 3m high. The BULL requires 5m² of clean, flat, level ground (eg. no rocks, uneven cobblestones etc). See FAQ. Wheelchair access with no tight corners and doorways with a minimum width of 1.2m are a must. Inclines, Door Lips and Stairs are very challenging (even small ones), you must discuss these with us before confirming your booking. Requires a normal 3 pronged, 15amp single phase, power source. We use between 5-9 amps (so plugging into a multi-box with other equipement is not an option ). We recommend wearing long pants (eg. jeans) for riding the bull, this lessens possible friction discomfort. The Bull can NOT be used outside in wet weather due to electrical safety requirements. If rain is forecast please contact us the morning of your event. Confirmation for bull booking will be sent by a return email to client from Total Entertainment. payment in full is due before date of booking unless prior arrangments are made. Client agrees to all terms and set up conditions listed on this page, including cancelations. If booking is cancelled within 7 days of event full fee may be charged. 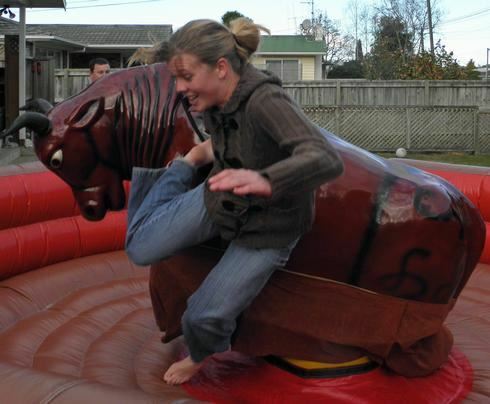 NB: Due to the cost factor to you, our client, we do not travel with our mechanical bull to the South Island . 1x console to run the bull. 1x inflatable safety rodeo pit (4.5m diameter). 2x professional operators to run the bull. we don't pack down until after the finish time you have booked the bull for. The photo's below give you a good idea of his size.